Martial Raysse’s new way of approaching reality has influenced the Blumarine Spring/Summer 2015 Show. Sylvie Vartan’s songs have influenced the Blugirl Spring/Summer 2014 Show. Another Sylvie Vartan-inspired item : Azzaro by Vanessa Seward Autumn/Winter 2011-2012 (a black minidress, decorated with white ruffles, paid homage to Sylvie Vartan). Julie Christie’s nonchalant elegance in John Schlesinger’s « Darling » was the starting point of the Blugirl Spring/Summer 2014 Show. Another « Darling »-inspired collection : Rosamund Pike X L.K.Bennett (the 3 bags that Rosamund Pike designed for L.K.Bennett’s Rosamund Collection, launched in July 2013, were influenced by Julie Christie’s effortless style in the opening scene of « Darling »). The pastel colors of the Blumarine Autumn/Winter 2013-2014 Show were a tribute to Juergen Teller’s past collaborations. A few Juergen Teller-lensed ad campaigns and collaborations : Calvin Klein (Juergen Teller shot the « Eternity » fragrance commercial), Céline (various campaigns, including for Spring/Summer 2010, and for the following seasons), Helmut Lang (ad campaign for Autumn/Winter 2004-2005), Katharine Hamnett (1997 ad campaign), Marc Jacobs (numerous campaigns since 1998, for Marc Jacobs and Marc by Marc Jacobs, that were compiled in the « Juergen Teller : Marc Jacobs Advertising 1998-2009 » book, published by Steidl, in 2009 ; for Marc Jacobs’ Spring/Summer 2004 ad campaign, that he also shot, Juergen Teller appeared in bed, alongside Charlotte Rampling, as his lover, Louis Quinze), Missoni (various campaigns, including for Spring/Summer 2010, and for the following seasons), Vivienne Westwood (numerous campaigns, including for Autumn/Winter 2007-2008, and for the following seasons, for Vivienne Westwood, Vivienne Westwood Accessories, Vivienne Westwood Anglomania, Vivienne Westwood Gold Label and Vivienne Westwood Red Label), Walter Van Beirendonck (Juergen Teller collaborated on the « Walter Van Beirendonck & Wild and Lethal Trash : Believe ! » book, published in 1998 by Rotterdam’s Museum Boymans-van Beuningen), Yves Saint Laurent (various campaigns, including for Spring/Summer 2005, and for the following seasons). 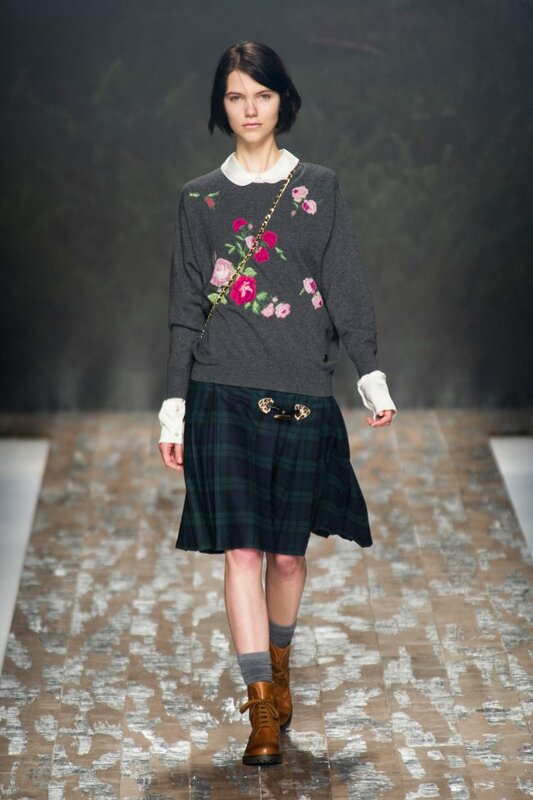 Alexa Chung is the inspiration of the Blugirl Autumn/Winter 2013-2014 Collection. Some Alexa Chung’s collaborations and one Alexa Chung-influenced item : Lacoste (Alexa Chung was the face of the « Joy of Pink » fragrance, which was launched in October 2010), L’Oréal (in April 2013, Alexa Chung will become the ambassador for L’Oréal Professionnel INOA Color), Made (for Spring 2008, Alexa Chung designed skull earrings for this eco-friendly jewelry line), Madewell (Alexa Chung created a collection for Madewell, which was launched on February 15, 2010, during New York Fashion Week), Maje (Alexa Chung was the face of the campaign for the Maje Autumn/Winter 2012-2013 collection ; she also stars in Maje’s Spring/Summer 2013 campaign and chose the 3 winners of a Maje competition on Facebook, and styled their looks, which were unveiled in the windows of the Maje stores, on February 26, 2013, during Paris Fashion Week), Mulberry (launched in January 2010, the « Alexa » bag was inspired by and named after Alexa Chung), New Look (in January 2009, Alexa Chung became the face of New Look), Pepe Jeans® Autumn/Winter 2010-2011 (Alexa Chung was the face of this collection), Superga (Alexa Chung starred in the campaign of the Superga Spring/Summer 2011 collection, that she also styled, to celebrate Superga’s 100th anniversary ; she also starred in Superga’s Spring/Summer 2012 campaign, which she styled). Moreover, Alexa Chung has modeled for DKNY and Vero Moda.